Equally as important as a door's design is the material used to build it. I use woods that offer strength, stability, durability, and beauty. Each wood has its own unique grain patterns, colors, and textures, and there is a perfect wood for each application. The majority of the woods used come from right here in North America, whether it's softwoods from the Pacific Northwest or hardwoods from the eastern United States and Canada. Exterior doors are made from redwood, Douglas fir, white oak, mahogany, and cherry, and interior doors can be made from virtually any wood species. All the lumber used comes from well-managed forests or from recycled and reclaimed sources. More information on these woods is given below. Coast Douglas-fir (Pseudotsuga menziesii) is one of the most important woods in the construction industry in North America. 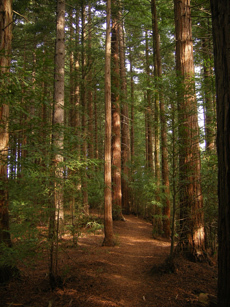 The coniferous tree can reach as high as 300 feet tall and 6 feet in diameter at the base. It grows along the Pacific coast from California to British Colombia, and smaller related species grow extensively throughout the United States and Canada. Because of its high rate of growth, resistance to decay, and structural strength, Douglas-fir has become the wood of choice for builders, from studs and beams to construction grade plywood. Old growth lumber is often quarter-sawn to produce tight, straight vertical grain and reddish-tan lumber for millwork and door construction. Douglas-fir is a relatively light, hard, and rot-resistant wood. It has been a top choice for door building for hundreds of years, and is well suited to exterior applications. While being a little more susceptible than some of the hardwoods to denting and scratching, it is remarkably strong for its weight, and vertical grain boards are more resistant to bowing and warping. Douglas-fir accepts paints and clear finishes exceptionally well, but like other softwoods, it can be challenging to achieve an even stain. The light colored soft growth rings absorb stain very quickly and deeply, while the hard summer growth rings absorb virtually none. To avoid a blotchy look, a clear washcoat must go on before any stain. African Mahogany (Khaya ivorensis) is a beautiful and durable hardwood from West Africa. The tree grows to 140 feet tall, 6 feet wide at the base, and has a canopy of up to 80 feet wide. As Honduras mahogany has become more scarce due to over logging, the more abundant African mahogany has become a much more popular choice for woodworking, both for interior and exterior uses. The color matures from a light pinkish, salmon color when freshly cut to a red-brown or golden tan-brown as it ages. As with other mahoganies, the straight grain boards usually have a very pronounced and striking "ribbon" grain effect. When a clear finish is applied, this ribbon grain adds an iridescent look to the wo﻿od. African Mahogany is a very strong, stable, and durable wood. It is also extremely resistant to decay, which makes it the most desirable choice for doors with direct exposure to the elements. It's stability, due to the unusual interlocking grain pattern, helps the door resist seasonal shrinking and swelling as well as bowing due to differences in indoor and outdoor humidity and temperature. Mahogany takes stains and clear finishes well, resulting in a very rich color and texture, highlighting the iridescent qualities of the ribbon grain. For wood with direct sunlight exposure, adding a small amount of UV blocking stain to the clear finish will help protect the wood's natural color. White Oak (Quercus alba) is an American hardwood that ranges from the southern states and Appalachians all the way to Canada. The trees reach 100 feet tall and 3 feet in diameter at the base. No other hardwood is more celebrated through American history, from early English craftsmen and colonists, to arts-and-crafts and prairie era architecture, than white oak. Quarter-sawing the wood produces a straight grain with beautiful and distinctive flakes, or medullar rays, that have made it a very sought-after material for fine furniture and interior millwork for hundreds of years. The color of the heartwood ranges from beige and creamy tan to a grayish brown. White oak is a heavy and extremely hard wood that offers the best abrasion resistance, making it a good choice for doors in high-traffic areas. It is also very decay resistant and can be used in areas with direct exposure to the elements, if properly finished. It also has an interlocking grain pattern similar to mahogany, which helps the wood resist warping and bowing. Although not as coarse and porous as red oak, white oak does have open pores that add to its texture. It takes stains and clear finishes well, highlighting the flakes in the grain. For wood with direct sunlight exposure, adding a small amount of UV blocking stain to the clear finish will help protect the wood's natural color. Black Cherry (Prunus serotina) is a classic American hardwood from the Eastern United States and Canada. The trees reach 80-100 feet tall and 2 feet in diameter at the base. The wood has been used extensively by cabinetmakers in the US as far back as the colonial era, and is more recently associated with high quality Shaker and Mission furniture. In addition to interior woodworking, this beautiful hardwood is also suited to door construction. When freshly cut, the wood is usually a pale tan, but as it ages it takes on its characteristic rich, red-brown color. The grain is typically straight and subdued, giving the wood a more homogenous look, but it can have subtle waves that add depth and character. Cherry is a moderately hard, heavy, and stable wood. This means that your door, under normal circumstances, will stay flat and will resist shrinking and swelling with seasonal changes. The wood is also naturally resistant to decay, so if it is properly finished and protected from the elements, your door should last for decades. Cherry has a fine grain and uniform texture that make it one of the easiest woods to paint or stain. Interior woodworking that is protected from direct sunlight can be finished with a clear coating that lets the wood naturally age. However, cherry is susceptible to UV rays and will lose its color quickly if exposed. The exterior side of a door must be protected from the elements, either by paint, or by a deep overhang and UV blocking stains. © 2014 Craftsman Door Company. All rights reserved.